According to researchers Kashdan and Silva, thriving on novelty indicates general well-being. In fact, people who seek novelty - something new and different on a regular basis - are "at an advantage in creating a fulfilling existence." Sounds pretty good. Another Ph.D., C. Robert Cloninger, says in the New York Times that "[n]ovelty seeking...keeps you happy and healthy and fosters personality growth as you age." I don't know about you, but I don't want to stale and stagnate as I approach my next decade. I choose vibrancy and #TwinTuesday instead of those bad things. 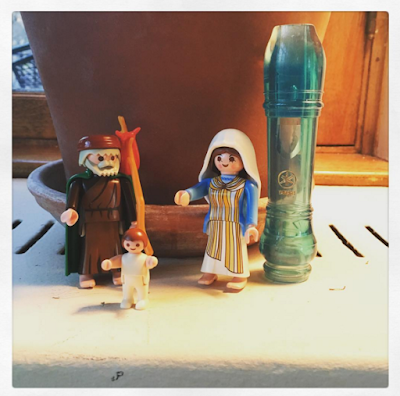 Finally, novelty in the form of seeing an image you've never seen before, like say, one of Nativity scene and Wind Instrument, activates a dopamine pathway in your brain. Drs. Bunzeck and Duzel actually confirmed this via fMRI, reports Belle Beth Cooper for Lifehacker. After seeing an unexpected image, you actually get a "rush of motivation to explore." I'm sorry, but that's a great and important impact of #TwinTuesday. Want to make your own #TwinTuesday? You totally should. It might increase your happiness and improve your motivation and personality.